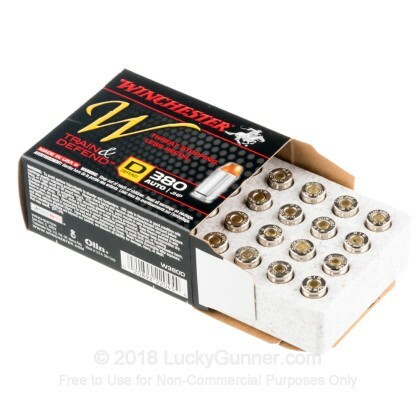 Winchester's W Train and Defend line of ammunition was developed to assist gun owners in finding practice ammunition that closely matches self defense ammunition. The FMJ bullets are associated with this 95 grain JHP round closely mimic the ballistics and felt recoil of the JHP round. This has the effect of helping you be more accurate and better prepared to defend yourself. The practice ammunition is sold seperately. 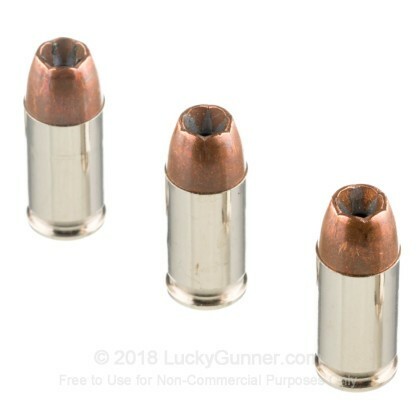 This self defense ammunition has a 95 grain jacket hollow point which is designed to expand rapidly after hitting soft tissue. 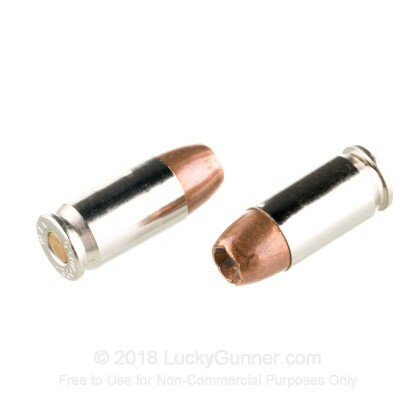 This expansion of the bullet is key to stopping a threat, and it is recommended that you carry JHP ammunition whenever carry an gun for self defense.Each round uses a reloadable Boxer primed brass case and is non-corrosive. 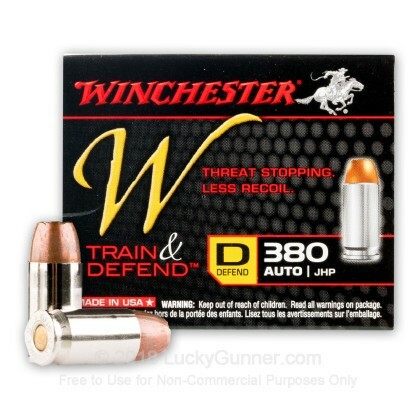 Winchester has a wide variety of self defense ammunition. No matter what gun or budget you have, you can find a solid self defense round that is perfect for you. Order your Winchester ammunition today! After firing five rounds of Winchester 95 gr Train & Defend from a Glock 42 into synthetic ballistic gelatin from 10 feet away through four layers of fabric to simulate clothing, we then measured the expansion and penetration of the bullets for this .380 Auto (ACP) load, which you can see in the chart below. 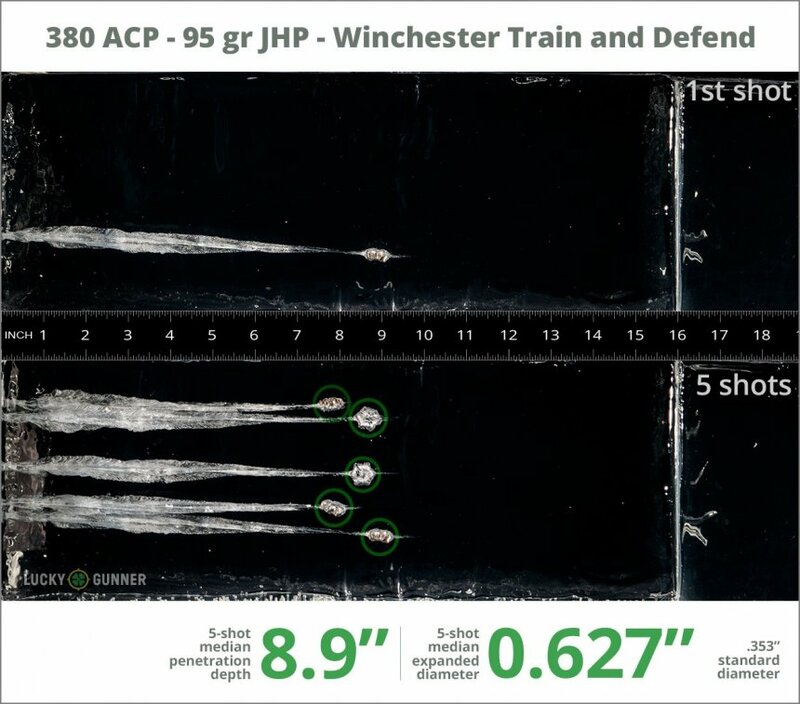 Finally, if you'd like to see how this Winchester load compares to other .380 Auto (ACP) loads, check out the diagrams at the bottom of the page. Want to know more about our ballistic gelatin testing and self-defense ammo? Check out Lucky Gunner Labs for more information. 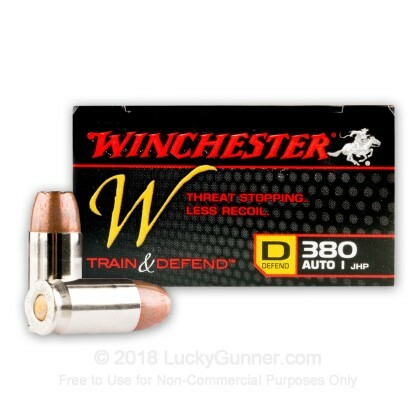 How do the results for this Winchester .380 Auto (ACP) compare to other 380 Ammo? 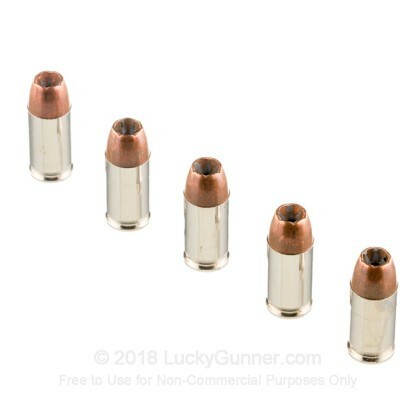 0.78" This ammo: 0.63" Min: 0.35" Median: 0.355" Max: 0.78"
8.9" 0" 6.5" 13.3" 28.7" This ammo: 8.9" Min: 6.5" Median: 13.3" Max: 28.7"
I got some of this in a promotion when I purchased my Ruger LCP II and had no idea what to expect. After a few shots I knew what I had. Smooth loading fierce ammo. Thanks Lucky Gunner for having it for me as I will definitely be getting some more. Seems like great ammo and a good value, but pretty consistently fails to feed. Seems like the hollow point gets hung up on the feed ramp of my LCP and my LCP 2. A light tap to the back of the slide feeds them the rest of the way in, but not reliable for self defense ammo in the pistols I'm using.